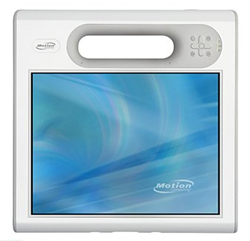 Motion Computing Motion C5: Mobile Tablet PC - Motion Computing, Inc. The Motion C5, the first mobile clinical assistant (MCA) that integrates technology from Intel® Health, combines durable design elements with key data capture technologies to simplify workflows, increase productivity, and improve overall quality of care. Designed based on input from thousands of clinicians, the C5 brings reliable, automated patient data management directly to the point of care. Get a handle on patient care with the C5. It's highly portable and lightweight. A convergence of technologies allows you to do everything you normally do during your shift such as perform clinical documentation, administer medication and take pictures using a single device. With Intel® Centrino® mobile technology and integrated high-speed wireless connectivity, the Motion C5 integrates key functions that clinicians require to be productive during the course of the day. Access and update patient data and schedules at any time. With the portable C5, you eliminate double documentation, increasing the accuracy of your information while decreasing the potential for transcription and medication administration errors. The C5 helps you confidently manage the 5 rights of medication administration: right drug, right patient, right dosage, right route and right time. Weighing approximately 3 lbs., the C5 is made for mobile use. Designed to handle the rigorous demands of the healthcare environment, the durable C5 helps you implement your existing patient safety processes for infection prevention without slowing you down. Its LCD screen is finished with a splash-proof seal, and the entire unit is easily wiped clean to enable disinfection. Use the C5, wipe if off, then keep working confidently knowing that you are helping to maintain a sanitary healthcare environment. The C5 has a number of healthcare-oriented security and compliance-oriented features that make it well suited for the hustle and bustle of the patient care environment. To ensure that only authorized users access sensitive patient data, use the biometric fingerprint reader or authenticate your badge with the RFID reader. Trusted Platform Module helps protect against inappropriate data transfers. Track and recover stolen or misplaced C5 units activated with ComputraceComplete.